Chewie after the first round of cleaning. Not shown: lots and lots of blue-black sludge. Relate to one of my existing hobbies or pastimes. Pretty soon I whittled it down to typewriter repair and fountain pen repair. And because I already had a couple of non-working old FPs lying around, FP repair won the toss. In the course of acquiring my small collection of FPs, I had done a lot of reading and research, so I already had a general idea of what the restoration process entailed. Armed with that very sketchy knowledge, I took to the web in search of tips and techniques. 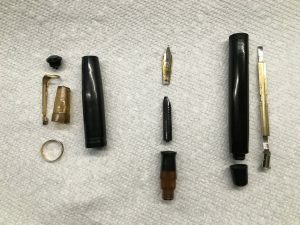 Between the repair Q&As on The Fountain Pen Network, the how-to videos by Stef on Grandmia Pens, and the abundant supplies to be found on Amazon and Pendemonium, I had what I needed to get started. My first project is a completely nondescript Wearever button-filler that I picked up for five bucks at an antique stall a couple years ago. I know, I know, I paid $4.50 too much for it — it’s just a Wearever, fergodsake. Well, maybe it’s blue-collar reverse snobbery, but I have a preference for low-end pens that were designed for average Joes and Janes. Besides, the first FP I ever picked up was a cheap Wearever Zenith that the late Bert Heiserman of Pen Haven resacced for me, taking the time to explain to a complete newbie how FPs worked and treating my pen with the same respect that he would give a rare and valuable Parker or Shaeffer. (It wasn’t until many years later that I realized how insanely lucky I had been to live mere minutes away from one of the giants of the antique FP community at the outset of my collecting hobby.) The Zenith has a buttery, expressive nib that is still one of the best in my collection and is still, alongside my Parker “51,” my favorite to write with. I think I’m going to nickname this pen Chewie — not because it’s huge, or brown, or particularly fearsome, but rather because one of its previous owners chewed on the blind cap. A lot. I’m still not sure if those dents will buff out. It’s going to need a new nib and a new sac, but it is mechanically sound and free of cracks. The inside of the barrel had a lot of cruft and what looked like a big glob of shellac, perhaps from a previous repair, that took a lot of gentle scraping to remove. The inside of the cap was caked with dried ink, and the inner cap was practically glued in; it required an overnight soak in water and a second bath of water, ammonia, and dish soap to free the inner cap. It required the same for me to be able to pop the nib and feed out of the section, after which a colossal quantity of blue-black sludge came oozing out like ancient Greek wine from a barnacle-encrusted amphora raised from the Tyrrhenian Sea. Flushing out the goop revealed that part of the section is translucent, made from a clear amber-tinted plastic. Very cool! After an initial polish, the clip looks pretty good. At first, I thought the cap ring was pretty heavily tarnished, but it looks like it may be that the gold plating has worn off part of it. Additional polishing will settle that once and for all. I have micromesh cloths and polishing paste coming via Amazon for buffing up the exterior, bite marks notwithstanding. I have already test-fit a sac and have to cut it to size; the pressure bar needed a lot of cleaning but it works great. With a new nib, I think I will soon have a very nice “beater” pen. Another nice thing about working with low-end pens like Wearevers is that you can get them cheap online or at flea markets (they’re the pens left behind after the collectors have swept through). They’re great for learning repair techniques; you don’t feel bad if you screw something up. Plus, they’re great for spare parts. And there’s a great weekly flea market about 20 minutes down the road from us. Guess where I’ll be? In addition to pen parts and tools, I’ve also been working on improving the shed workspace: a power strip and a big box fan for starters, and a long magnetic tool holder for all my pliers and forceps. Next, I want to get a wifi signal booster so I can pick up the house wifi signal (the shed is right on the ragged edge of the range). I mean, I may have to watch one of those videos in real-time, after all. I’ll post pictures when Chewie is all finished. I should have taken “before” pictures for contrast, along with the “during” shot above. I’ll remember to do that with my next pen. And the one after that. I think I’m going to really enjoy this new hobby. Neat. I wish I knew how to fix pens! With your experience fixing typewriters, you’d have no problem with fountain pens. I was a little surprised to learn how (comparatively) easy they are to disassemble and just how interchangeable the various components are.